Our Beaver Scouts wear the uniform of a light blue sweatshirt and Scout Activity trousers. They also wear our group emerald green scarf, which is presented to them during the investiture ceremony. 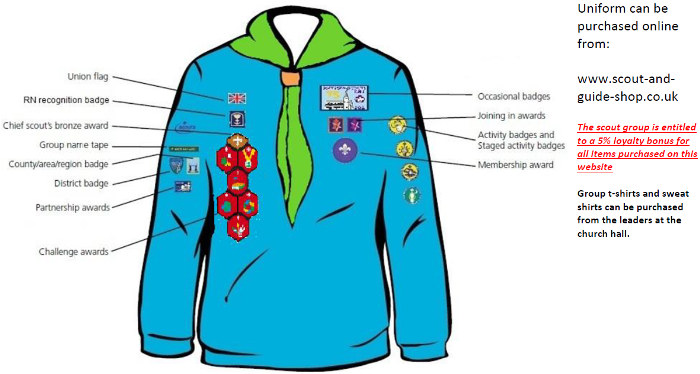 Uniform can be bought from www.scout-and-guide-shop.co.uk. You can ask the leader for more information on what to buy. 36th EFS Group Tee Shirt - Beavers also wear our Group tee shirts during meetings, particularly during the summer. These are avauilable from any Leader, as we hold the stock in our stores. Cost is £6. We don’t want anyone to miss out through financial hardship. If concerns about finances may prevent your child taking part in Scouting or some activities, speak to your leader, as some assistance may be available in confidence.